VANCOUVER - A massive landslide that ripped through a small hamlet in southeastern British Columbia last year, killing four people, was caused by a deluge of rain and a late spring snowmelt that triggered the largest slide to hit the region in at least 12,000 years, a report into the disaster concludes. The report, released Thursday by the Regional District of Central Kootenay, also warns more than a dozen properties in Johnsons Landing are still at risk of another deadly slide, meaning some residents will never be able to return to their homes. That reality has angered some current and former residents, who say homeowners in the high-risk areas have been left without enough help to relocate. 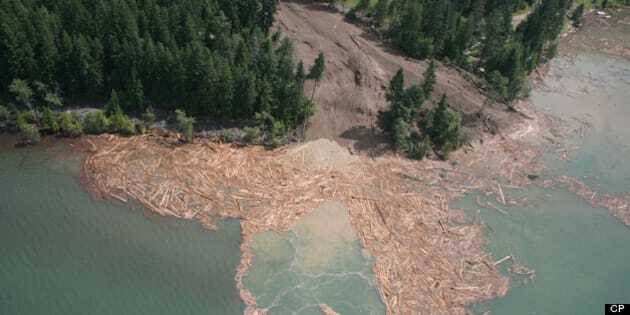 The slide struck on the morning of July 12, 2012, sending 320,000 cubic metres of soil, trees and rock down an area known as the Gar Creek channel, hitting several homes at speeds of up to 150 kilometres per hour. Valentine Webber, his 17- and 22-year-old daughters Rachel and Diana, and German woman Petra Frehse were buried in the debris, prompting a frantic rescue operation that was hampered by harsh weather and unstable conditions. All four died. The regional district's report suggests the slide was unprecedented in size and nearly impossible to predict. "Record June rainfall and late snowmelt saturated the soils on the slope above the community and triggered the landslide," says the regional district's report. "A landslide of similar size has not occurred in this area since deglaciation (last 12,000 years)." The debris destroyed five homes and left another damaged. Many other residents of Johnsons Landing, a community of about 35 people more than 200 kilometres southwest of Calgary, were forced to flee their homes, some of which are still under an evacuation order. The report identifies 18 properties that remain at risk of another potentially deadly slide, including five where the risk is considered "very high." That means the risk of dying for someone living on those properties due to a slide in any given year would be as high as one in 10. Nine properties are in an area considered to be at a high risk, while four more are in a zone where the risk is considered moderate. The report recommends restricting land and house development on those 18 properties unless geotechnical research indicates those areas are safe, but it also says such work would likely be too expensive to conduct for some of those properties. Jillian Madill's log home was damaged beyond repair in the slide, and her property is now listed as high risk. That assessment means she and her husband cannot rebuild and it will be impossible to sell what has essentially become a worthless piece of land. Madill said she received help through the province's disaster assistance program, but the funding represented less than half of what her house and property were worth. She hoped either the regional district or the province would come up with additional help or, at the very least, buy the property from her. Madill said she was told in a meeting with regional and provincial government officials this week that no more help was on the way. "We are going to own (the land) — we have to demolish the buildings that are still standing and I guess continue to pay taxes on it," said Madill, 69, who had lived in Johnsons Landing for nearly three decades. "It's quite an incredible story. They're not going to give anybody a dime for land ." Madill has been living in Howser, about 30 kilometres north of Johnsons Landing, in a house that was owned by a friend who recently passed away. She and her husband haven't yet decided where they will relocate. "We have to find another home, and we have very limited resources to do that," she said. "We don't have many options." Chris Duffy, executive director of Emergency Management BC, said in a written statement that he could not comment on individual cases. Duffy noted the disaster assistance program provides compensation either for the costs of relocation or 80 per cent of the assessed value of the home — whichever is less. The maximum amount that can be paid out under the program is $300,000. Justice Minister Shirley Bond, whose department oversees the provincial emergency program, issued a statement about the report that noted the province has spent more than $1 million in its response to the slide, including more than $300,000 paid out from the disaster assistance program. Bond's statement said the province would be working with residents to ensure they can receive the maximum compensation available to them. The regional district could not be reached for comment. Thursday's report said previous assessments of the area did not raise the possibility of such a massive landslide. The report notes, however, that local residents observed high water levels in local creeks, increasing amounts of sediment in the creeks, and debris blockages in the days and weeks leading up to the slide. — Establishing uniform and consistent criteria for assessing landslide risks. — Creating a landslide monitoring program, including collecting data on slope movements, rainfall and snowpack accumulation and melt. — Launching a public awareness campaign about how to recognize unusual creek activity and slope instability. — Creating communication plans and protocols to update residents and visitors of local conditions when there is an increased risk of landslides. The regional district said in a news release it would review the recommendations to determine what steps it will take. "We have already spoken with those residents in the highest hazard zones so they understand the level of risk to their particular properties and to themselves," Dawn Attorp, the regional district's manager of corporate administration, said in a statement. "We still have a considerable process ahead of us before we can lift the evacuation order for the landslide area and take the next steps in supporting the community in its recovery." The justice minister said the province was also studying the report's findings. "Moving forward, government will now be reviewing the regional district's report thoroughly as we evaluate our response and support to ensure that best practices and the highest standard of services are delivered within the program," Bond's statement said. She said the Transportation Ministry will also be considering the report's recommendations that steps be taken to ensure people travelling through the Johnsons Landing area are safe.